Florence, Italy is the capital city of the Tuscany region and is one of the country's most important and historic cities. Full of beautiful, Renaissance-style buildings, including wonderful churches and enormous palaces, Florence is steeped in culture and atmosphere, and has not changed greatly since the 16th century. Standing alongside the banks of the River Arno, Florence lies amongst spreading olive groves and Italian vineyards, and continues to overwhelm tourists by its sheer beauty, particularly when you reach sights such as the Basilica di Santa Croce and the famous Basilica di Santa Maria del Fiore (Duomo). Tourist information is readily available in Florence, with official tourism outlets being located on the Borgo Santa Croce, the Piazza della Stazione, the Via Cavour, and at the nearby Amerigo Vespucci Airport. As a general rule, visitors to the city will find that Florence hotels can be expensive, although there are often some great hotel bargains to be found. Florence hotels, as with all Italian hotels, are rated on a star grading system, with the highest rated hotels offering the ultimate in luxury. At the more inexpensive end of Florence accommodation are the basic rooms of the hostel (ostello) and guest house (casa di ospite), as well as several campsites (campeggio). Finding accommodation is difficult, problems being heightened at the top of the tourist season (July to August) and therefore booking your Florence hotel reservation in advance is advisable and virtually compulsory in high season. 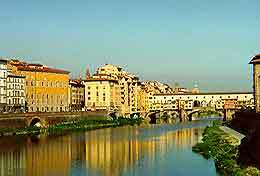 As with innumerable great cities, Florence is built around a large river, the River Arno. This can be crossed at many points, but without doubt the most grand of all the bridges is Ponte Vecchio (Old Bridge), which was built in 1345. This three-arched bridge is the oldest bridge in Florence and is lined with many shops, mostly jewellers and goldsmiths. High above the shops is a secret passageway that links the Uffizi Gallery to the Pitti Palace, and this is now open to the public. The powerful Medici family, who came into power in the 1430s and became rulers of Florence for several hundred years, greatly influenced the appearance of this city. They commissioned some particularly grand buildings, town squares and gardens that are still standing today, exuding opulence and character. Many of Italy's most famous artists have also had a hand in designing and creating some of the majestic artwork and interiors to be found in Florence, including the likes of Michelangelo, Donatello and Leonardo Da Vinci. Amongst the many Florence attractions not to be missed are the Duomo (the fourth largest cathedral in the world), the Bargello (one of the first national museums in Italy), the Uffizi (the world's oldest gallery), Palazzo Vecchio (the city's town hall since 1322), Santa Maria Novella (probably the most important Gothic church in Tuscany) and the Accademia di Belle Arti Firenze (if only to view Michelangelo's 'David'). State-run museums give a discount to EU citizens under 25 and those over 65, whilst anyone younger than 20 automatically receives a discount at city-run museums. 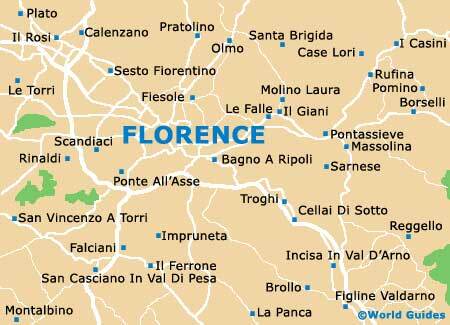 More information about Florence Tourist Attractions. The city centre of Florence is quite compact, with many of its chief attractions being consolidated in a few areas, resulting in the main highlights being accessible by foot. In fact, it is possible for pedestrians to traverse the city centre in approximately half an hour. Visitors choosing to make use of the Italian public transport here will find the orange buses of the ATAF service dependable and reasonably priced. Alternatively, the white taxis that may be hired from official taxi ranks are expensive, although very convenient. 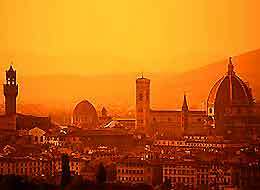 The city is served by two large nearby airports, Pisa International Airport (Galileo Galilei) and Florence Airport (Amerigo Vespucci), both within each reach of the city centre.